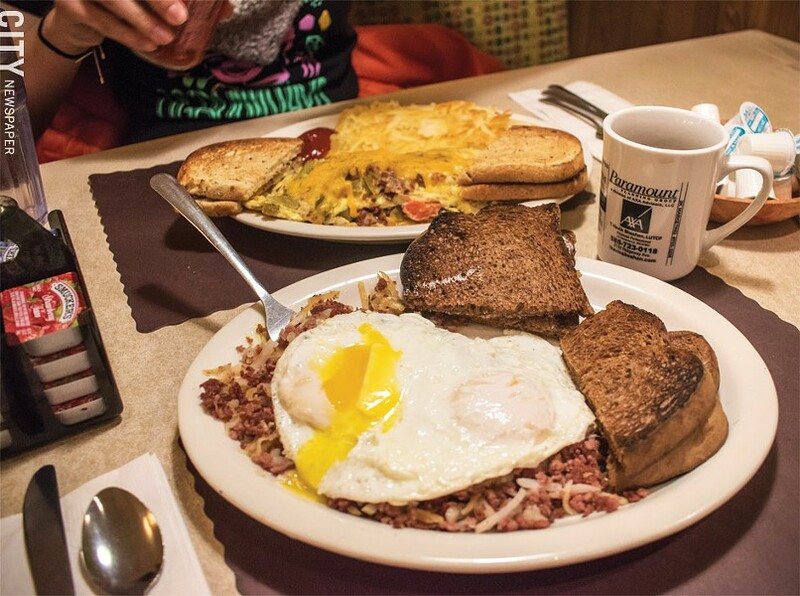 PHOTO BY JACOB WALSH The homemade corned beef hash with over-easy eggs and pumpernickel toast (front) and Artist's omelet (back) at Jim's at The Mall. Monday through Saturday, 7 a.m. to 9 p.m.; Sunday, 8 a.m. to 6 p.m. It may seem antithetical that our latest look at local diners takes us to The Mall at Greece Ridge. Usually populated with banal chain restaurants, malls typically don't include classic, independent diners. Jim's at The Mall, originally opened in 1967 by George Criticos as Critic's at The Mall, was an original tenant in the area's first suburban mall. But the diner would fit well into any neighborhood or town. Its pedigree is earned through the guidance of Elena Knapp, whose diner ownership résumé also includes the original, now closed Jim's on Winton Road and Jim's Too, which became Jim's on Main. In December of 2014, a fire destroyed Jim's Too. Six months later, the owner of the building housing Jim's sold the property, and Knapp was forced to vacate. After going from two restaurants to none, Knapp was approached by Criticos about buying Critic's. To get a feel for Critic's, and because she insists on working in businesses she owns, Knapp worked there for six months, and on April 1, 2016, she purchased the business and renamed it. Knapp then focused on enlivening the restaurant by creating a homier and friendlier atmosphere, expanding the menu, extending hours, and lowering prices. These efforts, led by Knapp and her son, Stavros, fostered a more convivial environment. There's even a seating area toward the back of the restaurant that caters to families with young children. On the menu you'll see dishes honoring family members, such as Papou's Greek omelet, Nana's Italian omelet, or the Kobe Slam Wham breakfast sandwich, named after Knapp's daughter's dog. Conveniently located near Entrance 6 (near Barnes and Noble), you don't need walk through the mall to dine here, though you can look out into the mall from a table in the glassed-in "patio." There is also a J-shaped counter with stools, but the majority of the seating is two- and four-person booths. Worth noting, even if the need doesn't arise, are the bathrooms, which have "sanitary door openers" on the inside that cleverly allow use of a forearm, instead of a hand, to open the door. My first meal at Jim's at The Mall was with friends who turned me on to it: Paige, Chris, and their daughters, nine-year-old Rayme and four-year-old Elsa. Both kids love this place, and Rayme says she especially appreciates the "very kind people here, the servers never tell you to hurry up." Jim's has homemade soups on the menu daily, and I chose cream of chicken noodle ($3.29/cup; $3.79/bowl). I like soup served very hot, and this didn't disappoint. It was silky and rich with wide, squiggly noodles and abundant chicken and carrot chunks. Rayme let me sample her ham and cheddar soup ($3.29/cup; $3.79/bowl), which was a liquefied version of the classic sandwich, with bits of smoky, salty ham. Paige, Chris, and Rayme each had a favorite: the Buffalo chicken wrap ($8.49), filled with chicken tenders, melted cheddar, lettuce, and tomato. They opted to order it with Critic's Sauce (instead of wing sauce), which is a sweet, sour, and tangy recipe from the original owner. Elsa had her go-to meal from the kids' menu: macaroni and cheese with French fries ($4.99). When I asked her the best thing about it, she unequivocally proclaimed, "Cheeeeese!" My chicken parmesan sandwich (with homemade macaroni salad, $10.25), was an ample, crispy, pan-fried (with panko breading) breast on fresh French bread. Because my clothing possesses special properties that attract sauces and condiments, I felt grateful for the relative un-messiness of this sandwich, with a just-right proportion of both sauce and cheese. Paige shared some of her huge slice of homemade carrot cake ($3.95, Knapp's own recipe) with me. Very dense and moist with a tangy cream cheese frosting, it stands as a unique version. For my own dessert, I gravitated to the rice pudding ($3.25). Creamy, with distinct vanilla notes, it was served in a tall parfait glass with whipped cream and dusted with cinnamon. On a subsequent visit, I started with a crock of French onion soup (available daily, $4.49). Piping hot, the soup had a well-balanced and rich, beefy broth, with nicely-browned and melted provolone, tender onions, and abundant homemade croutons. It avoided the common pitfall of being too sweet or too salty. The basic side salad that came before my gyro sandwich ($8.99) was improved by the Greek dressing with feta -- one of eight homemade dressings that Jim's also sells by the pint. The gyro itself was hefty, filled with mildly-spiced beef and lamb, lettuce, red onion, tomato, and tzatziki, inside a lightly-toasted, pillow-y pita. I finished with one of the best pieces of cheesecake ($4.59; additional 50 cents for strawberry or blueberry topping) I've had in Rochester. Firm, tangy, and ethereal, it is an original Critic's recipe that Knapp makes with a secret ingredient she says is "not usually found in cheesecake." I don't make a habit of having dessert after breakfast, which is served until 2 p.m. But on my third visit, following my order of homemade corned beef hash -- a heaping mound of corned beef, shredded potato, peppers, and onions -- with two eggs over-easy and toast ($7.95), I just had to immerse myself in that cheesecake once more.